Ut Gret sound like they should be Russian, but are actually are an American band. The name Ut Gret derives from a tribe of imaginary marauders down from Valhalla for the day, and a play on the medieval word for middle C, and I only made a bit of that up. Founded as far back as 1981 by Joee Conroy, who eventually teamed up with Steve Roberts, once a member of that fine Zappa goes to Canterbury outfit French TV, the group released their first album Time of the Grets in 1990. Ancestors’ Tale is the band’s first for AltrOck, and by the sound of it, the high class Italian progressive boutique is their natural home. The playful but clever nature of the band name is reflected in the richly diverse but never difficult music on offer. Woven into the dense tapestry of instrumentation old and new (see list below) is a heady mix of chamber rock, avant rock, and plain old high quality songwriting which all combine to produce a highly involving and organic record that breathes a draught of fresh air into these weary ears. 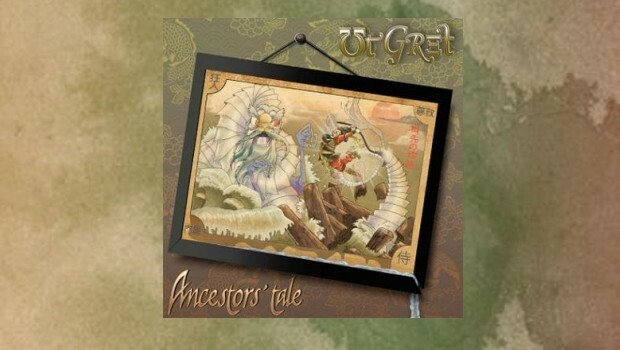 Ancestors’ Tales is one of those rare records that improve every time you hear it. While it certainly makes an impressive initial impression, it is obvious on that first listen that there is way too much going down here to be absorbed in one sitting. The best way to listen to this is on the cans with no distractions, as it is more than deserving of your rapt attention. Four of the tracks feature the sublime vocals of Cheyenne Mize. A great name, and a great singer, Cheyenne is another of those characterful voices that the modern North American progressive music scene is producing with such ease these days. Along with the likes of Morea Dickason, Elaine di Falco, Kyree Vibrant and no doubt others, this is a bounteous time for female progressive vocalists across the pond. The first of Cheyenne’s contributions is on the opening title track, wherein a laid back electric piano groove provides the backbone for her dreamy musings on the whys and wherefores over a symphony of bassoons and clarinets, all rather lovely. A short improv with sax and didgeridoo (it’s not every day you can use a description like that!) leads into Hopperknockity Tune, which started life as a tribute to the Soft Machine legend over a decade ago, and now includes a section of “multiple time signatures occurring simultaneously” with the clarinet and bassoon blowing away in another plane. Somehow drummer Gary Pahler nails it down, and Mr Hopper would be proud of the outcome. A lyric that hangs on the phrase “round and round” is never going to be atop a straightforward tune when a band such as Ut Gret are anywhere near the music stand, and Selves Unmade does not disappoint. Here we have another Softs vibe going down during Steve Good’s bass clarinet solo which apparently juxtaposes 7/8 against 4/4 drums. I only have a slight notion as to what that may mean, but it sure got me tapping my feet! The Raw, the Cooked and the Overeasy develops into a medieval jazz symphony with restrained Crimsoid guitar, and forges some true progressive music over its mere five and half minutes. I could listen to this track all day long as Cheyenne introduces the musical journey with some appropriately ill-defined lyrics possibly on the Grets’ place in the scheme of things. A special mention for Greg Ackers’ flute on this one, as it steals the tune away on wing and a prayer. The CD booklet is another tastefully assembled affair, the likes of which I have come to expect from AltrOck. The artwork runs the gamut of graphic design over the centuries, working as a whole in much the same manner as the disparate strands of music pull together to make for a spellbinding hour’s worth of audio delight. You can never have too much bassoon, and over the top of a fugue-like piano section in the middle of An Elephant in Berlin we are treated to some fine low frequency rumblings from Jackie Royce’s contra-bassoon. This quiet section is the lull after the Krieg payback of an Allied wartime raid on the German capital, collateral damage taking out the zoo. It paints the bleak picture wordlessly and perfectly, before the dissonance returns relentlessly. Then we are treated to the “greatest contra-bassoon solo in rock history”, emulating the titular beastie of Dinosaur on the Floor, before Cheyenne enters the fray to dig those bones and calm things down. If The Grotesque Pageantry of Fading Empires is not a contender for track title of the year, then my name isn’t Marianne. This deceptively low-key tune is a remnant from Steve Roberts’ days in French TV and is one of three credited solely to the keyboardist and multi-instrumentalist. The songwriting elsewhere is spread throughout the band, with Joee contributing to most of them. However, this album is not about individuals but more the consummate ensemble playing, again to the fore on this second of Roberts’ three tunes. It takes on an almost Philip Glass-like structure, giving the opportunity for some great reed blowing. Crimsoid homage is made on Zodiac, a tune that includes a dissonant ending wherein Steve Good plays the thematic twelve-tone row backwards, a “simple pleasure” according to the lightly humorous and always highly informative liner notes. And so we arrive at the end of the album all too soon. Walk The Plank hoists the Jolly Roger over the good ship Ut Gret as our visiting marauders sail off into a vivid Caribbean sunset, leaving us landlubbers to wipe a tear or two from from our eyes, all to the accompaniment of a lyrical and rare guitar part from Joee, seagulls wheeling and diving in the ship’s wake. We await your return with anticipation. Sadly this album will be ignored by a lot of folk who claim to be progressive rock fans and who waste their attention on bands long, long past their best, but hopefully there will always be enough of us who recognise what real progressive music is and can be, in order to keep great bands like this in the studio or on a stage.